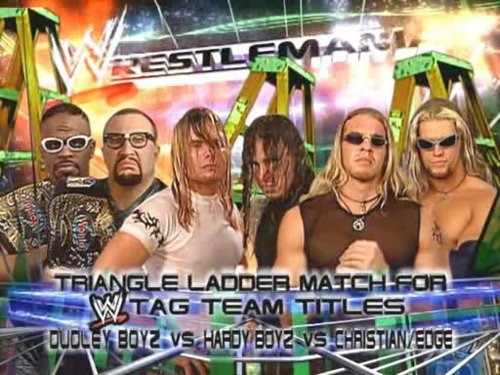 As the year 2000 began, the WWF Tag Team scene was amazing with three teams at the top of the ladder, figuratively and literally. After a tough ladder match between The Hardy Boyz and Edge & Christian at No Mercy 1999 and a big battle between The Dudley Boyz and The Hardy Boyz in a table match at Royal Rumble 2000, the road would lead to one road and one road only: A triple threat tag title match. As a result of those two previous matches, we would see these three teams embark on a journey that would lead them to four matches over a year's time, involving a ladder and sometimes, tables and chairs. Today, I wanted to take a look back at the feud between these three teams, but only the matches that feature all three teams and take place under special circumstances. Intrigued? You should be. Let's take a look. -This is my favorite match between the three teams. Essentially, it set the tone for the future, as these teams put everything on the line to come away with the tag team titles. 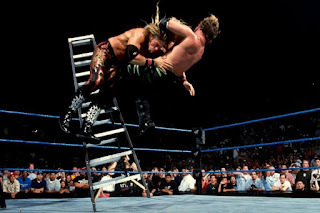 Originally billed as a ladder match, these teams would bring out the tables and chairs to make an impact and the result would turn out to be a true classic. What made this match so exciting was that it felt fresh, and there was no shortage of high impact moves throughout. 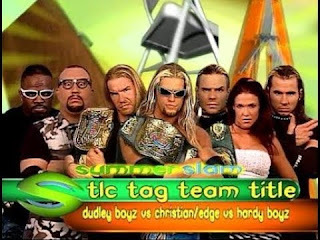 While I was rooting for the Dudley Boyz to win, a precedent for their feud was set when Edge and Christian walked away with a victory and the titles draped over their shoulders. If I had to rate this match on a scale of 1 to 10, this gets no less than a 9 or 9.5. It's that good and really, without this match, TLC wouldn't actually exist. -I am not the biggest fan of this match and I'll be honest. I think it's overrated by many because it's the original, but of the four matches I'll discuss here... It's my least favorite. 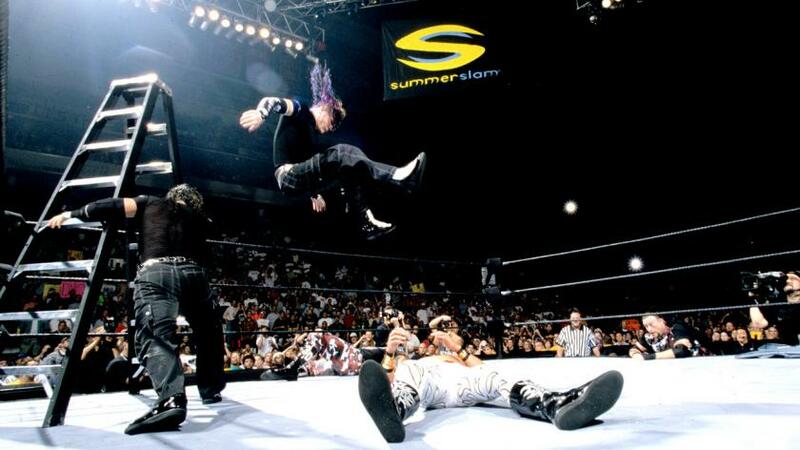 This match managed to incorporate a few more elements that the first triple threat didn't have, including a huge Swanton Bomb from Jeff Hardy from the top of the ladder, but for the most part, this match didn't have the same fire as the original. Perhaps it was the fact that this match wasn't at Wrestlemania, but it just didn't have the big fight feel that their first encounter did. Still, I'm not mad at the action here, but at under 15 minutes, I can't help but think this match could have been given a bit more time to really flesh out. It was 8 minutes shorter than the first one, and perhaps that it is what it took down a notch to me. On the scale of 1 to 10, I would give this match a 7.5 or 8, as it was still good, but was missing what made the first an undisputed classic. Edge and Christian pull off yet another victory to make it two in a row. -This has the same issue IMO that the first one had. It was too short. Don't get me wrong, this is better than TLC 1, but still doesn't have the vibe that you'd expect it to have. It is a good match and many people consider it a classic and I agree. It is a classic. It's a better match than the first TLC but not better than their initial match the year prior at Mania. 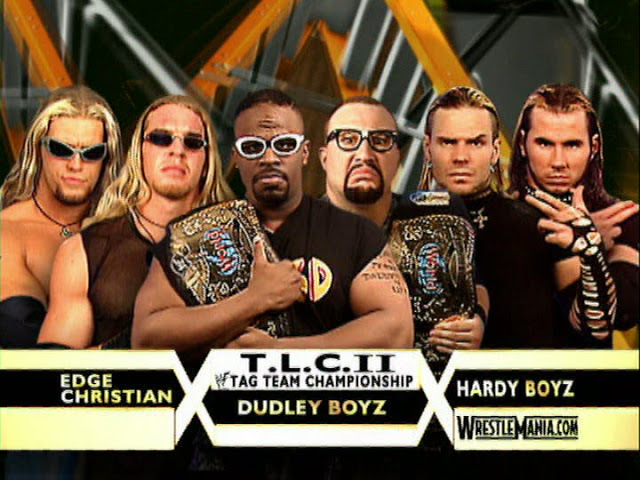 However, what made me a fan of this one a bit more than the first TLC is that they managed to fit more into this match along with more interference and higher profile spots. Still, there was something about this match that felt important. It felt like the final chapter or the culmination of the feud and of course, as it was in the first two matches, Edge and Christian win with the help of Rhyno. On a scale of 1 to 10, I would give this an 8.5 or maybe a 9. If given more time, this would surpass the first contest between the three. -This was the last chapter. With Chris Benoit and Chris Jericho added as the fourth team, we got the first ever TLC match with four teams. This match was on par with the first TLC contest and while it wasn't better than the first triple threat match at Wrestlemania 2000, I think it was a bit better than the Summerslam 2000 first TLC encounter. 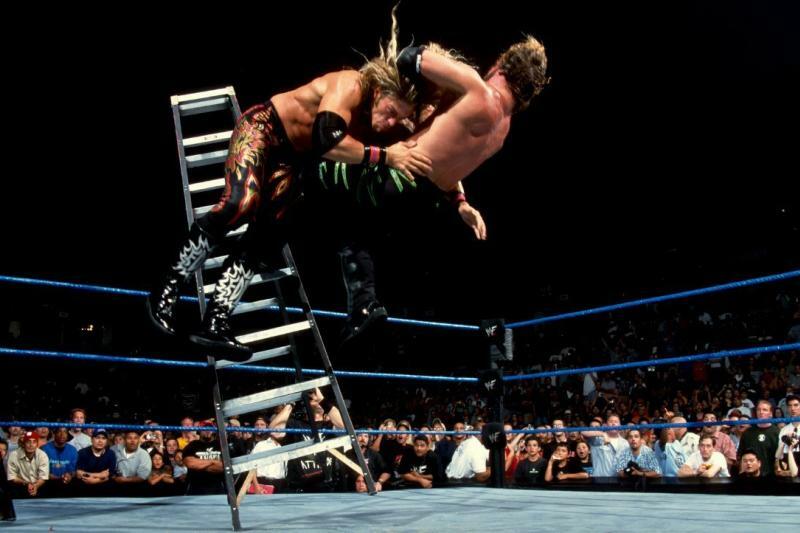 What made this match a bit more exciting to me honestly is the inclusion of Benoit and Jericho as it gave their feud a bit more fire than it had prior. The three team feud was running its course and what better way to finish off their legendary battle than with Benoit and Jericho breaking the curse and winning, marking the first match that involved all three teams that Edge And Christian didn't win. This is a great match and I would rate it around an 8 or 8.5 and it was a great crowning moment for Benoit and Jericho and a silent, but powerful end to the best feud of the Attitude Era for tag teams.